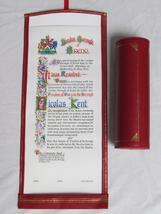 Suitable for containing Scrolls of Honorary Freedom, Freedom of Entry, or Addresses of Welcome or Congratulation. Designs can be executed in wood, solid silver, perspex and silver, or various combinations of these materials. Illustrations appear below. The silver caskets can be decorated with Coats of Arms, Monograms, etc, by engraving or enamelling, as appropriate. In the case of wooden caskets, or the perspex type with silver ends, an engraved plate can be fitted in addition to, or instead of, any other decoration. Scrolls can be placed in caskets either as they stand (perhaps rolled and tied with a ribbon or braid) or placed into a Persian Morocco leather backing, which can be supplied in a variety of colours (red, blue, green, maroon, etc.) according to your individual requirements. These backings are individually hand produced to a high standard, with gold tooling decoration. Persian Moroccan leather casket. Available in a variety of colours (red, blue, green, maroon, etc.) with gold tooling decoration. Individually produced by hand to a very high standard. In ALL cases additional engraved details (e.g. inscription plates, logos, etc.) are extra. Please note that the prices are subject to alteration depending on the complexity of the design. 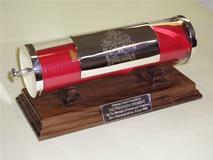 A silver and perspex scroll style casket, with a silver engraved crest on the body of the casket. Silver ends and a silver presentation plaque attached to the hardwood base. Contains a red leather backed scroll. 12” Silver and perspex casket with a silver engraved crest on the body of the casket. Silver ends and a silver presentation plaque attached to the hardwood base.